12 Comments on Drain your scraps before they land in the Bokashi bin! ve to get rid of the excess moisture. The easiest way to do that is to simply put a newspaper inside the bin for a few days, it will absorb the humidity and most of the smell will disappear. How do you know when it’s too wet in your bin? You’d think the drainage tap would take care of all liquid issues but for whatever reason not all liquid goes down to the bottom. Some goes up and hangs in the air pocket over the food waste. Some forms condensation droplets on the inside of the lid. And this is the point at which your bin starts to stink. Next time you open your bin, check the underside of the lid. Condensation? Then it’s too wet and it would be worth tossing in a newspaper. If it’s not a big problem it could be enough just to add a toilet roll or two, or an empty egg carton, something along those lines that will take up the moisture. quite soggy after a couple of days, then it’s done its work. You can leave it in there if you like, but if you think it’s just taking up a lot of valuable space you could remove it — just add another paper if and when needed. When you’ve got a newspaper in there it’s also a good chance to push down the contents of your bin, at least your hands won’t get icky in the process. And the more compact it is in your bin the better the Bokashi process will work. I suspect this also helps squeeze down moisture towards the drainage tap too, and that’s always a good thing. reat to lay out under bushes (especially berry bushes if you have them), in garden beds or veggie patches. Admittedly, they look a bit silly and will blow away as soon as they dry out, but you can always cover them with some bark, leaves or soil so they look a bit better. Have a peek under the paper after a few days, most likely it will be a full-scale worm party right there under your nose. rly always needed in a standard outdoor compost to compensate all the leaves and other green stuff. And the microbes and nutrients just help it all along. Or you can tear it into shreds and simply dig it down into your soil. The worms will love it, and after all it’s the worms that feed the plants so why not? food scraps in during the day. That means they can run off for a few hours before landing in the bin. 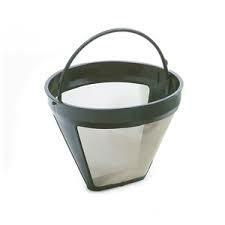 Especially useful if you’re fighting with a bin that is always too wet, or a family that is hard to train. Kids can always find their way to the little white box and put in their apple core. Once or twice a day, probably when you’re cleaning up after a meal, it’s just to take the drained-off bits in the white box and add them to the Bokashi bin. s stopped dripping. Especially if you brew a lot of coffee at home! So a neat and tidy drainage solution is not so silly. Previously I’ve used a terra-cotta plant pot with an extra drainage tray as a lid. Works well, and the lid is not so silly if you have banana flies in the summer. And, if you’ve got a Bokashi bin in the corner of your garage somewhere, would some of this be the reason you lost interest? May be time to have another go — your garden will thank you for it! Just another thought: if you have a lot of loose tea leaves to deal with or make coffee in a french press you’re probably tearing your hair out with all the wet mess. At home we have one of these nylon coffee filters lying around in the sink, it gets in the way a bit, but as there’s always some tea or coffee slops to deal with we put up with it. They dry out really fast then you can dump them in the Bokashi bin. Also works well if you end up with a lot of wet, slimy rice in the sink. Just scoop it up and drain if off in the filter for a while. Really helpful advice as my bokashi has been very wet since we’ve started using loose tea leaves instead of tea bags. 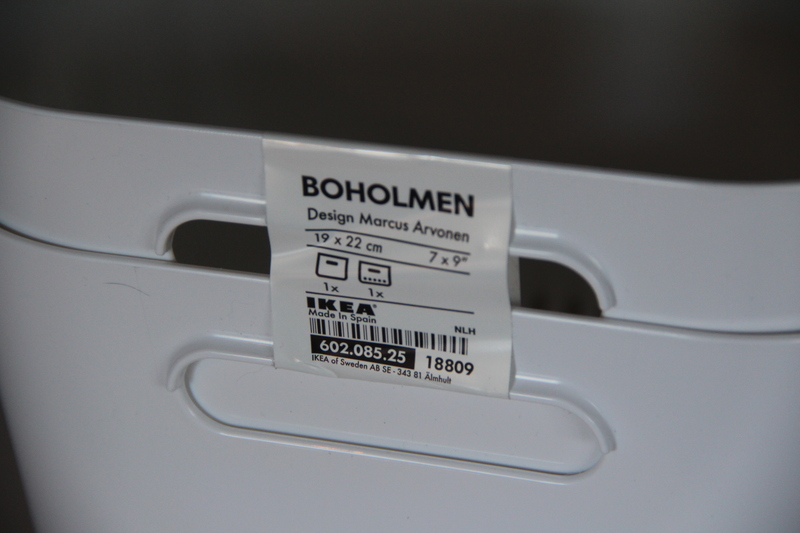 Could you give the name of the ikea item so I can check if our local store stocks it. (The items here in Oz still have their Swedish names). Hi Trish. I just added another closeup pic of it, scroll down to the end of the entry. It’s called Boholmen (which is a really silly name if you know what it means, something like “living island”, home island, or something like that! But it could be a real place name so fair enough.). Hope you can find it! Otherwise it’s just to invent something similar that will work for you. We use a lot of loose tea leaves at home too, I have a nylon coffee filter that works perfectly to tip them into, they dry up really fast. It tends to live in and around the sink and is even useful for those times when you fish up a handful of rice or other bits from the kitchen sink and don’t quite know what to do with them. Hey rinconette – I’m in Oz too and just checked IKEAs online catalogue – they have it! $19.99. I’m going to get one too! Newbie here, and my first batch of bokashi is only halfway made, but the draining thingie from Ikea is a really good idea. We have several Ikeas here in Tokyo. I think a lid might be useful. I haven’t put particularly wet things in, but have already produced a lot of bokashi juice. It comes out kind of brown looking, presumably from all the tea leaves and coffee grounds that have gone in, but smells good enough to drink! As it has to be diluted a lot, I am wondering what to do with all of it. I poured some in my compost bin, but maybe I shouldn’t as the bin is (maybe was) full of earthworms, and it is very acidic, isn’t it? One idea I have had, and wonder if anyone has tried it is to use the diluted juice to water my sprouts. I have a mini system going in my living room (Tokyo apartments are SMALL) with about 5 or 6 types of sprouts going at the same time. They are grown in special containers and their roots are in water. I should think it would work. I am having to resist the urge to buy extra veggies to cut up and feed my bin! Another week, and it should be ready for the two week brewing stage. It’s wonderful to be able to write enthusiastically here, as people around me get glazed looks when I talk about it! Hi Elisabeth! Yep, you’re safe here! There’s probably more of us Bokashi nerds out there than you’d realize (I assume we all look sort of normal if you’d meet us on the street :)). But it’s great to be able to talk about food scraps with others who actually think it’s cool too. It’s the way of the future, so in a few years they’ll just think we’re gurus, haha! Sounds like you’re in business there with your new bucket. Be really careful with your sprouts, may be worth trying with a 1:1000 dilution to start with. Let’s hear what you find out! As for pouring the liquid in the compost, go for it. It’s acidic in the beginning but soon normalizes and it will give your compost pile/bin a good kick in the bum. Don’t worry about the worms, they may avoid the acidic bit for a week or two but will be more than happy for the overall process. But dilute the bokashi liquid if you’re worried so it spreads around a bit more. Where are you going to dig down your fermented Bokashi? Or will you put it in the compost bin? Reblogged this on Cameron McNeill, Sydney, Australia. Getting excited as I am nearly ready to compost my first matured bin!! What will I find when I tip it into its bed? Doing that on Saturday, and then going away for two weeks! Almost can’t wait to get back, to see if it is true or not! Not so good — I walked in tonight to the distinctive smell of rotting citrus 😦 Too late right now to drain the bin (my second one). Hmmm. We will see! Well, it’s true! When I got back, after two weeks away, and did an exploratory dig in the container, almost everything had ‘disappeared’! All I could find was some onion skins and a little bit of tomato. I have planted okra in that container and am hoping for success! I have also processed my second container, which rotted even faster, as the weather is much warmer.Any input on whether I should stir up the mix before planting? It is currently about 5 inches of soil then, 4 inches of now disappeared bokashi topped with about 4 inches of soil. The first batch I just planted straight into. 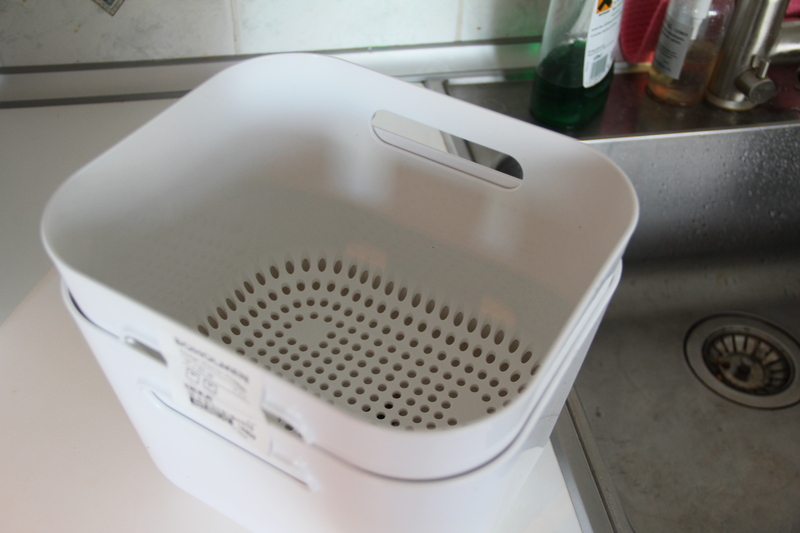 The bokashi bin is pretty stinky when I open it to put more in, but with the lid on, I can’t smell anything. The second batch I made made less juice, as I followed Jenny’s advice and strained the scraps before putting them in. It is really so easy and so quick– I am thrilled! Hi Elisabeth! This is great news, good on you! Where do you live? Looks like your under-tree feeding system will work perfectly, it’s a great idea. Anything that can make life simpler just has to be a good thing! Whether to stir up the mix or not is completely up to you, the process will run faster the more contact there is between soil and bokashi. So a bit of a mix is a good thing. On the other hand if you just layer it like you’re doing it will work fine too, maybe a week or two slower but how important is that in the great scheme of things? Probably what you’ll find is when you’ve had a few buckets through the same in-ground container it will go faster, the weather is always a factor, but after a while you’ll have so much micro-life going on down there that new material will get a kick start. Assume you’ve got a fair few worms as well? Keep up the good work and great ideas, it’s brilliant with some inspiration! ps sorry for the slow response, been a bit busy on other fronts. Spring in other words! This year I start to add some wooddust / woodshaving in the Bokashi. You can buy it in the supermarket by the animalproducts. I read about brown en green materials ( Carbon / Nitrogen ) in the Bokashi-mix. The dry woodshave wil also absorb fluids and the structure of the final Bokashi is better then when you only used fruit / vegetables. I’ve started doing Bokashi in home made buckets, outdoors. Fine during Summer in Melbourne. Great to share with others, and thanks for the tips Jenny. I think the tea leaves, plus things like grapes and tomato scraps have been making mine too wet. I pull on a pair of rubber gloves and squash it down every day when I add the scraps, and empty the juice every day. My full bucket has been ‘cooking’ for nearly 3 weeks and we are about to empty it into the geddes bin. There are lots of baby grubs in it now. Maggots? Ugh!